Woolard, Kathryn A. 2018. The Sociolinguistics of Place and Belonging. Vol. 45, Issue. , p. 115. Britt, Erica 2018. Oral History and the Discursive Construction of Identity in Flint, Michigan. Journal of Linguistic Anthropology, Vol. 28, Issue. 3, p. 252. Trnka, Susanna 2018. The Politics of Joking. p. 179. Lopez, Jameson D. 2018. Factors Influencing American Indian and Alaska Native Postsecondary Persistence: AI/AN Millennium Falcon Persistence Model. Research in Higher Education, Vol. 59, Issue. 6, p. 792. Kotani, Mariko 2017. Dynamic Nature of Boundaries of Speech Communities: Learning and Negotiating Codes in Intercultural Communication. Journal of Intercultural Communication Research, Vol. 46, Issue. 5, p. 463. Ketterer Hobbis, Stephanie 2017. “The Comic and the Rule” in Pastagate: Food, Humor and the Politics of Language in Quebec. Food, Culture & Society, Vol. 20, Issue. 4, p. 709. Nading, Alex 2017. Orientation and Crafted Bureaucracy: Finding Dignity in Nicaraguan Food Safety. American Anthropologist, Vol. 119, Issue. 3, p. 478. Graber, Kathryn E. 2017. The Kitchen, the Cat, and the Table: Domestic Affairs in Minority-Language Politics. Journal of Linguistic Anthropology, Vol. 27, Issue. 2, p. 151. McIlvenny, Paul 2017. Identity Revisited and Reimagined. p. 41. Amrute, Sareeta 2017. Press one for POTUS, two for the German chancellor. HAU: Journal of Ethnographic Theory, Vol. 7, Issue. 1, p. 327. Souleles, Daniel 2017. Don't mix Paxil, Viagra, and Xanax: What financiers' jokes say about inequality. Economic Anthropology, Vol. 4, Issue. 1, p. 107. Hall, Bradford ‘J’ 2017. The International Encyclopedia of Intercultural Communication. p. 1. Marks, Jonathan 2017. WHAT IF THE HUMAN MIND EVOLVED FOR NONRATIONAL THOUGHT? AN ANTHROPOLOGICAL PERSPECTIVE. Zygon®, Vol. 52, Issue. 3, p. 790. SHIPLEY, JESSE WEAVER 2017. Parody after identity: Digital music and the politics of uncertainty in West Africa. American Ethnologist, Vol. 44, Issue. 2, p. 249. Hanks, Michele 2016. Redefining Rationality: Paranormal Investigators' Humour in England. Ethnos, Vol. 81, Issue. 2, p. 262. Westermeyer, William H. 2016. Local Tea Party Groups and the Vibrancy of the Movement. PoLAR: Political and Legal Anthropology Review, Vol. 39, Issue. S1, p. 121. Stasch, Rupert 2016. Dramas of otherness. HAU: Journal of Ethnographic Theory, Vol. 6, Issue. 3, p. 7. Keisalo, Marianna 2016. A semiotics of comedy. HAU: Journal of Ethnographic Theory, Vol. 6, Issue. 2, p. 101. Kroskrity, Paul V. 2016. Some Recent Trends in the Linguistic Anthropology of Native North America. Annual Review of Anthropology, Vol. 45, Issue. 1, p. 267. Koven, Michele 2015. The Handbook of Narrative Analysis. p. 388. 'The Whiteman' is one of the most powerful and pervasive symbols in contemporary American Indian cultures. 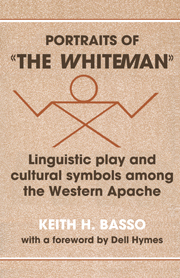 Portraits of 'the Whiteman': linguistic play and cultural symbols among the Western Apache investigates a complex form of joking in which Apaches stage carefully crafted imitations of Anglo-Americans and, by means of these characterizations, give audible voice and visible substance to their conceptions of this most pressing of social 'problems'. Keith Basso's essay, based on linguistic and ethnographic materials collected in Cibecue, a Western Apache community, provides interpretations of selected joking encounters to demonstrate how Apaches go about making sense of the behaviour of Anglo-Americans. This study draws on theory in symbolic anthropology, sociolinguistics, and the dramaturgical model of human communication developed by Erving Goffman. Although the assumptions and premises that shape these areas of inquiry are held by some to be quite disparate, this analysis shows them to be fully compatible and mutually complementary.